Especially the little details-- the scarf on the bag, buckles on the shoes, long necklace. What was happening at the British Parliament? A hijabista fashionista session?! Chic and powerful at the same time. Love the whole outfit. this look is so fly! love it! It was an event with Dalia Mogahed, one of the most inspirational young American Muslim female role models of our time. Mashallah, the event had sooo many young women - they certainly outnumbered, and outfashioned the brothers. maybe it was one of the monthly dialogues organised by the Muslim News. I like her style, from the waist up though :). A skirt would have looked so nice with it. 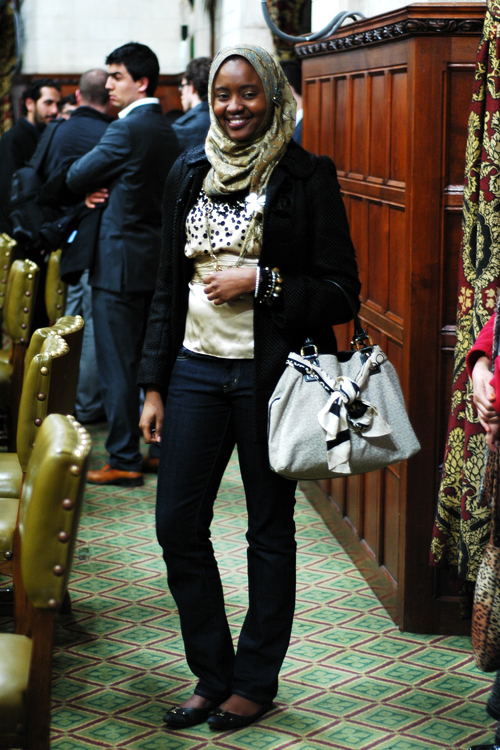 Tres chic, but I can just hear the really conservative types say that a silky vest is not really hijab-compliant. A pale gold handbag would have also worked better.